How’s your team with TEAMWORK? Have you ever thought your business lacked true group solidarity? Do your managers work together well to solve problems? If you are wishing to breathe new life into the normal running of day to day operations, Kick Masters Karate has the solution for you...Corporate TEAM Building. TEAM Building at Kick Masters is tailored specifically to your business/institution. From set-up to execution of TEAM Challenges, your staff will develop team synergy, experience positive team achievement, and will learn the value of clear communication. All this is accomplished in an engaging and professional environment that facilitates collaboration among its participants. In short, we present situations to empower individuals to overcome difficult personal challenges and perceived limitations; all while having a blast! 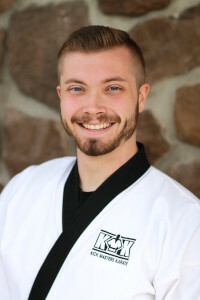 For the past eighteen years, Kick Masters Karate has been building leaders in our community through martial arts training and age/ability-specific programs. Our commitment to excellence in the dojo is evident in our students, but most importantly is unmistakable in each Black Belt staff member. This comes from superior structure, intense group interaction, and individual leadership development. With the disciplined background of the martial arts as a base, the nurturing of TEAM development is effortless. And, in our state of the art, 8,000 square foot facility, learning is easy. So what exactly will my staff do? Pipe-Marble Challenge - Each group is assigned a task of getting a number of “data marbles” from the “receiving information tray” to the “delivering service tray.” Teams may not use their hands, but can only use their section of the “action pipe.” A number of “action pipes” align together only one way for the “data marbles” to be delivered. Total allotted time: 15 minutes. Walking the Plank - Each team is given the task of getting all members from point A to point B using six strings and two wooded planks. Only three persons may go at a time. Team members are not allowed to use their hands to touch the planks, and must not at any time touch the ground with any part of the body. Total allotted time: 20 minutes. Corporate Concentration - Groups must work together turning over giant boards of items associated with your business (i.e. doctors = medicine, carpenters = tools). As items are matched, teams earn points, adding to their total seminar score. But watch out, not all the items have matches. Total allotted time: 20 minutes. *Whether you choose a series of challenges that are more physical or a group of situations that are more thought provoking, the results are the same: better verbal communication, team synergy, and most importantly, situational, “hands on” fun! So how do I schedule this? Corporate TEAM Building is a fantastic way to take your business to the next level in team solidarity. To learn more, please contact us at (301) 689-8874 and ask for an info binder and individual business consultation regarding Corporate TEAM Building. This is one executive decision you'll be glad you made! �What you did today was flat out amazing! The team building exercise was a grand slam, out of the park blast! Everyone was talking about it during the breaks. Well done in every way possible!"